Educator should definitely run through this exercise before introducing it to students. This investigation is not an experiment, so a prediction of which tree loses its leaves earliest in the fall might be more appropriate than asking students to form an hypothesis. 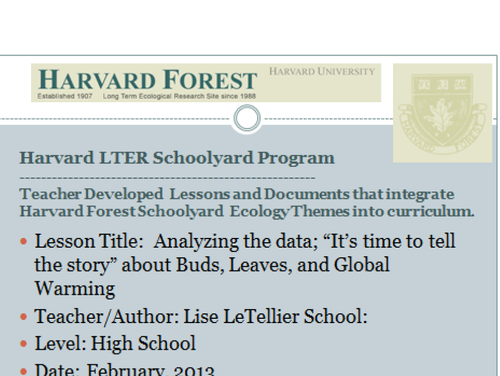 Activity has students access and analyze selected phenology data from the Harvard Forest Schoolyard Long-Term Ecological Research (LTER) project, to study changes in the growing season of deciduous trees in New England. The two-year length of the graphing component is not long enough to discern trends. The Harvard Forest database does contain some longer records that would allow for a few more years of data. Even so, none of these records are long enough to suggest a robust trend. Caution students about forming a conclusion based on a short record. Comments from expert scientist: Very good type of activity to show relationship of vegetation phenology to climate and climate change. It's unclear if the scientific link among vegetation phenology, growing season, and climate change is discussed. This seems mostly an exercise in learning how to graph data - the primary objective is stated as such. Activity is carefully and thoughtfully written with explicit teacher notes and student directions, background information, and screenshots to guide access to and use of the data; assessment rubric is provided with sample assessments representing honors and IEP-accommodation students. Educator is integral to initial explanations of this lesson. Once students understand the database and what is expected, they should become more independent. Students will need computers with Internet access, Excel or or other spreadsheet software, and a printer.